The clocks have gone back, and as the nights draw in, Diwali, the festival of lights, this week celebrates the victory of good over evil, light over darkness and knowledge over ignorance. And it has been Bonfire Night too. So it seems fitting to shine a light on five of the best table lamps. 1. The Rod table lamp by Sebastian Cox has a shade made of compressed hazel fibres, and the stem is a steam bent hazel rod (H 5 4x W 12 x D 20 cm). The coppiced hazel is grown locally and harvested in the winter as part of a sustainable woodland management programme. Hazel is light, strong, with a fine grain and fast-growing. The lamp is an honest, elegant piece that brings a bit of native British woodland inside. The lamp costs £175 including an LED bulb. 2. The Flos Kelvin mini task lamp, designed by Antonio Citterio, is widely available from retailers including John Lewis for £175. In sleek contrast to the Rod lamp, but with eco-credentials nonetheless as it is made of recycled aluminium. The arm and head are adjustable for focused light from the 30 LED lights which contain a chemically-etched diffuser to soften the light. The lamp’s dimensions are H30 x W12 x D12cm. 3. After natural, renewable and recyclable materials, I have end of life in mind when including the DIY Table Lamp designed by Rona Meyuchas K from Kukka. This is a traditional lamp, with a twist. It could be used at home or the office, or where ever you choose. It is made of 6 screws, 7 pieces of beech wood, lamp holder and cable. The wood is unfinished, so you could paint, lacquer or sand it to suit your style or leave it natural. If you want to short-cut that detail you can order it in a range of 7 colours. The dimensions are 53 x 43 x 10cm, and the lamp costs £115. The lamp is supplied with a 40w reflector bulb, an LED alternative would use around 85% less energy and last 20 times longer, or an energy-saving halogen bulb, which would be around a 30% saving on a standard 40w bulb. 4. Drws y Coed, means to door to the woods in Welsh, and the dappled lighting of their table lamp creates a sense of connection with woodland. The products are made from birch plywood and local Welsh timber. Digital technologies, such as laser cutting enable a micro manufacturing in North Wales close to sources of timber, and inspiration. The Merddyn Gwyn Lamp (pictured) is based on a beaker from Merddyn Gwyn Bronze Age archeological site in Anglesey. The dimensions are H38 x W12 x D12 cm and costs £90. In a waste not, want not vein, the pieces of ply laser cut out of the top of the lamps are repurposed as coasters! 5. D.I.Y. Either refresh an existing lamp, revive an ebay purchase, or start from scratch. A wine bottle is a popular choice for a lamp base, or a vintage find. You can buy table lamp kits online, and follow instructions online from Wikihow, or find a local course. In London, the Goodlife Centre runs How to make a lamp evening courses. Be sure to read and heed all warnings and follow the directions with the lamp kit. For simple instructions on how to make a lampshade visit the Channel 4 website, or find a local course and get some tips from an expert. Lolly & Boo run lampshade courses in a couple of locations in the south, and Rustiques run workshops with Annie Sloan paints and fabrics in Aberdeenshire. 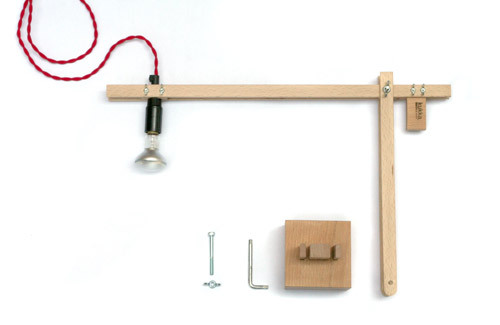 Have a peek at Folly & Glee for a range of DIY lamp making accessories and inspiration. DIY Lamp available to buy http://shop.kukka.co.uk shipping is free!